Snuggle up with your favorite nursery rhymes and drift into the magical worlds of all your most treasured fairy-tale characters. This beautiful story-time treasury brings together the talents of illustrators from around the world, with well-loved stories and rhymes to delight and excite children. 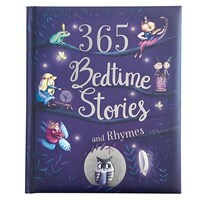 Find new stories and adventures to fill your imagination every night before bedtime with 365 Bedtime Stories and Rhymes. Sweet Dreams! Bond with your child through family story time and strengthen a love for books and reading.